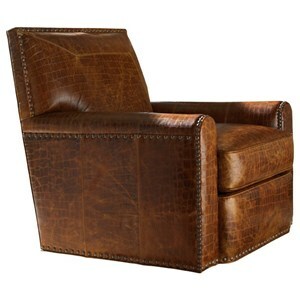 With its inviting presence that just makes you want to take a seat, and its casual-contemporary vibe, the Torres Leather Chair will bring your home the perfect blend of fashion and function you’ve been searching for. Available only as shown, this chair is upholstered in a distressed leather similar to that of an aged bomber jacket with light sanding and subtle sauvage. Traditional rolled arms have taken a contemporary twist on this chair with their more geometric shape, further embellished by a decorative Old Gold nailhead trim. The ultra down seat cushion and loose blend down back cushion provides a most comfortable place to sit down and sink into whether conversing with friends and family, watching a movie, or curing up with a good book. 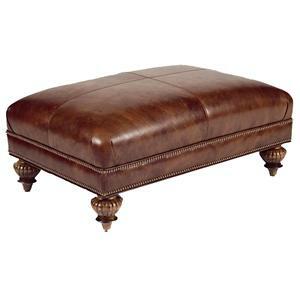 Create the perfect relaxation location in your home by pairing the Quick Ship Torres Leather Chair with the coordinating ottoman. 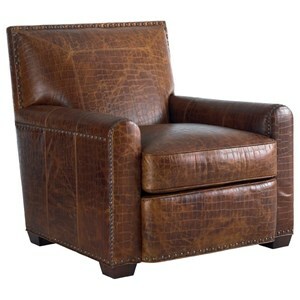 The Tommy Bahama Upholstery Quick Ship Torres Leather-Upholstered Loose Back Chair with Geometric Arms & Decorative Nailhead Trim by Tommy Bahama Home at Hudson's Furniture in the Tampa, St Petersburg, Orlando, Ormond Beach & Sarasota Florida area. Product availability may vary. Contact us for the most current availability on this product. The Tommy Bahama Upholstery collection is a great option if you are looking for Transitional Contemporary furniture in the Tampa, St Petersburg, Orlando, Ormond Beach & Sarasota Florida area.